Quinoa, sweet and crunchy cherry tomatoes, zesty cilantro, and feta altogether make the most refreshing and light summertime salad—perfect for BBQ season! 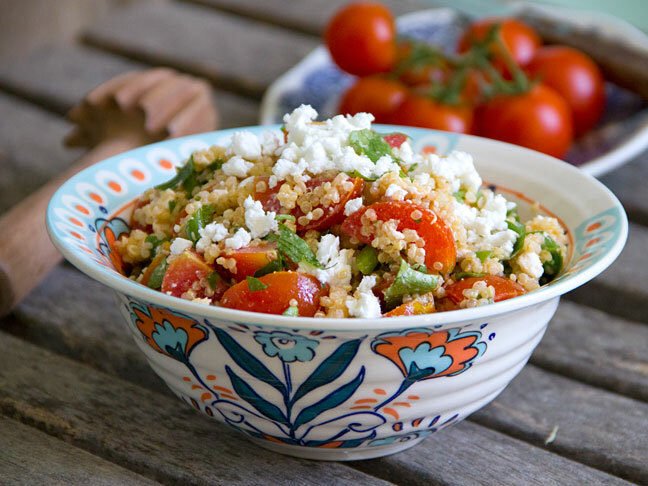 Whip up this quinoa tomato feta salad recipe to bring to any get-togethers this summer! Step 1: Chop your veggies. Quarter the cherry tomatoes, chop the cilantro leaves, and thinly slice the scallions, on a diagonal. 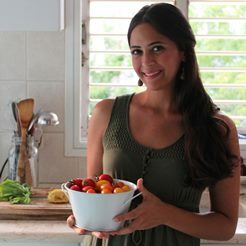 Step 2: In a medium sized bowl, toss the cooked (cooled) quinoa with the quartered cherry tomatoes, chopped cilantro leaves, sliced scallions, and crumbled feta. Step 3: Drizzle in the olive oil, white wine vinegar, and lemon juice. Season to taste with salt and pepper.